Yes, this is the voice of our protagonist, Georgie, an emotional teenager with a wild temper to boot. In comparison to the smiling and graceful picture of Georgie on the front cover, we are given a sulky and moody young lady. This allows me to recite the moral, ‘never judge a book by its cover’. This feisty page turner has a lot to offer a variety of ages as the subject of football merely becomes a sub plot, a catalyst for an honest story of a girl finding her way after the death of her mother, whilst dealing with a life that is changing around her. 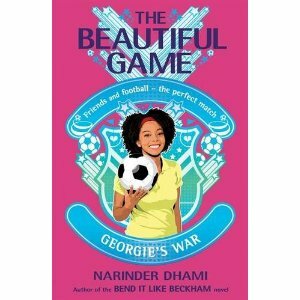 The author Narinder Dhami, most famous for her novel Bend it like Beckham, which is based on the film that I saw and loved over a thousand times, has recently released this series of books The Beautiful Game and they have been very successful. They are essentially just stories about footy-loving females but I think that Dhami’s real success is due to dealing with the universal and eternally relevant themes of love, friendship and family. Dhami appears to have a great insight into the younger reader’s mind and the novel, although clichéd at times, tactfully hit’s the teenage nail on the head and is an entertaining and enlightening read. Georgie is the goalkeeper of the Springhill stars or rather the ‘Purple Petunias’ as called by her teasing brothers. All of her “BFFL” (Best Friends For Life) play for her team as well as being her schoolmates and along with their flaws, to Georgie, her friends are the best that anyone could have. The change in Georgie’s life that causes all of the drama is when she meets the replacement of her favourite coach, the ‘sour faced old dragon’ or ’SOFD’ (because we should all be abbreviating) Ria, who she assumes is out to make her life hell. Georgie refuses to accept Ria and they clash several times. The real twist in the story and for me the greatest part is when Georgie sees her Dad in the car with Ria going out on date. I actually “oh no’ed” out loud at that point. I knew there was going to be trouble. Georgie’s maturity and patience are tested several times and with help from the family and friends around her she eventually realises the whole world is not conspiring against her and she attempts to cope with all the changes. Dhami has ignored all the usual stereotypes of women’s football and shows us the benefits of being part of a team and being passionate about something. She emphasises the ambition of the modern female and breaks traditional rules of gender roles. The realistic character of Georgie could quite easily be any young girl and this makes her so easy to identify with. The novel teaches the young reader it is ok to show emotion, it is key to talk about your feelings and not to be afraid of being yourself. This is all endorsed by Faye White (England women’s captain) ‘A sure-fire hit for every girl’…how lovely!